FB42 is our crystal clear soft fold box that measures 2 1/2" x 1 1/8" x 2 3/8". Package crafts supplies such as stamps, cutouts, pins, jewelry and more in this durable, 12 mil thick box made of PET material. Assemble by folding along lines to shape the box and secure with interlocking tabs. Round stickers are included for a tamper-resistant closure. Stickers are included, to purchase additional stickers click here to see our full list of sticker options. A sparkling clear box offers an easy way to showcase your products. Our FB42 box measures 2 1/2" x 1 1/8" x 2 3/8" and is a great choice for products like stamps, cutouts, stickers, pins, jewelry, and candy. This box is made from PET material and is designed to last. 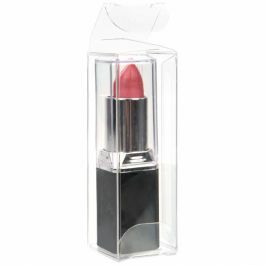 This anti-static plastic is both scratch-resistant and FDA approved for direct contact with food products. Assembly is a snap. Simply shape these boxes by folding along soft creases. Boxes ship flat to save on shipping costs. Clear round stickers are included to provide a tamper-resistant closure. 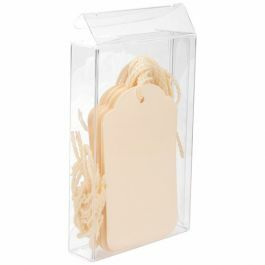 Dress up this box with accessories such as stretch loops or ribbons for a pleasing finish. Outer Dimensions: 2 1/2" x 1 1/8" x 2 3/8"
Most popular use is for packaging small items such as crafts and jewelry.